This is a brilliant investigation on the intransigence of love. 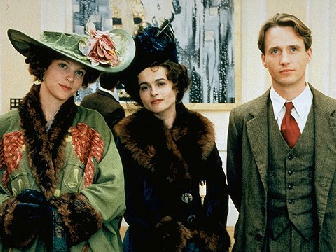 Would-be femme fatale Kate (Bonham-Carter) finds her plotting to get both love and money unhinged by jealousy. Iain Softley directs beautifully and all three leads perform brilliantly. Of course Venice looks good but the trappings of period drama, where pomp and costume get in the way of the drama, are avoided with the dissection of the corrupting influence of cynicism. The final scene where the protagonists make cold love in a garret are amongst the best portrayal of emotional desolation that I can remember in cinema. Beautifully framed close ups of Kate’s pale demeanor as she lays down her final condition for marriage to her lover are haunting in the despair they signify. If only all adaptations of great ‘period’ novels were this good. 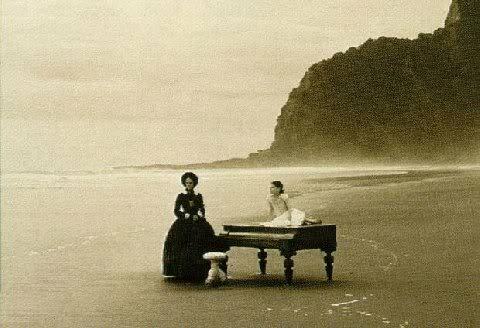 The Piano was one of the most feted arthouse films of the 1990s and stands up well at the end of the noughties. Beautifully shot, fabulously performed, fantastic direction, gorgeous music, a feminist message plus much to debate about; there’s not much more you can want from a film. It portrays the plight of middle class women in Victorian times through Ada’s repression (she doesn’t speak); her treatment by men; the ridiculous clothes women wear; Ada’s daughter’s betrayal of her. Two endings are also offered, further fueling debate about what a woman should do in a man’s world. After the feminist advances of the 1970s we seem to be going backwards into a mainstream acceptance of traditional ideas about what constitutes men’s and women’s work (and roles). Bourgeois ideology has absorbed ’70s feminism into the ‘girl power’ of the Spice Girls and Cheryl Cole can happily pose on the UK listing magazine, Radio Times, with her thighs apart (tastefully done of course). So the issues raised by The Piano probably need airing more than they did in ’93. The representation of the Maoris as ‘uncivilised’ is problematic, mostly because of the dearth of representations of Maoris in cinema as a whole. However, if we consider them as a dramatic device to compare to the Englishmen’s behaviour it is acceptable. If you haven’t seen the film; you need to. I imagine this film was sold to the ‘money’ as ‘East is East for the noughties’. It attempts to offer a ‘state of the Muslim-‘white’ relationships post-9/11 as a (mostly) comedy. And overall it succeeds. Unlike East is East, where the real racial tensions of the ’70s were swept into the DVD extras, Mischief Night doesn’t minimise the antagonism between Muslim and non-Muslim, but highlights them. Neither the white underclass class nor the ‘traditional’ Muslim family (daughters being married off to Pakistani cousins) are represented postively but they are all recognisably human. The children are particularly good, avoiding cutesy with a street-tough, foul mouthed attitude required to survive. However I’m doubtful whether the described bussing takes place that means schools in Leeds (and it is explicitly set there) are segregated actually takes places – maybe someone could enlighten me. As a dramatic device emphasising racial segregation, however, it is acceptable. An interesting film, then, that makes a good stab at commenting upon ‘now’ in British society. It has the failings of melodrama, that it cannot offer a poltically radical take as it focuses on individuals, but is certainly more honest than East is East.